Provenance: Acquired by ArtFair. Signed and Stamped Certificate of Authenticity (COA) with Di-Faced Tenner authentication attached - the authentication process involves an image of Princess Dianna on a £10 "banknote" (a Banksy creation) which is hand numbered and then torn. Then one part of the note is stapled to the COA and the other retained by Banksy's representatives (Pest Control). This of course makes it extremely simple to authenticate a particular Banksy piece purchased from ArtFair by matching the two parts of the note together. Banksy Collectors: Banksy collectors are reported to include Damien Hirst, Brad Pitt, Angelina Jolie, Jude Law, Macaulay Culkin, Paul Smith, Jake Gyllenhaal, Gwyneth Paltrow and Christina Aguilera. Opinion: Banksy has captured the world's attention and held it since the late 1990s, when his controversial stencilled artworks rose to fame and transformed him into Britain's most celebrated graffitti artist. His contempt for authority is no secret and he continues to display powerful artworks on walls, streets and bridges across the globe. He has also produced a range of highly-collectable limited edition artworks which have become hugely popular. Comments: A rare opportunity to own this mint condition, iconic piece of art. Whether you are a first time Banksy buyer, a regular collector or an investor looking to diversify your portfolio with tangible assets, Banksy's art, as it has shown in the past, may prove to be a lucrative investment. Click here to see if we have any more of Banksy's work available on ArtFair. Express an interest in No Ball Games Grey by Banksy. You'll be contacted as soon as possible. © If artwork shown on ArtFair is already sold or unavailable for immediate sale, we'll do our utmost to source a similar edition for you. ArtFair is a trading name of LeadFair Ltd. Co. Reg. Number 08565869. Reg. Address: Swift House, 18 Hoffmans Way, Chelmsford, Essex. CM1 1GU. Registered in England and Wales. VAT Reg. No. 169725662. Registered with the Information Commissioner's Office: Data Protection Reg. No. ZA025012. Artwork prices can go up or down. ArtFair offers fine art, contemporary art, urban art, pop art, and modern art through our own collection and our global network of art gallery partners, art dealers and private collections. 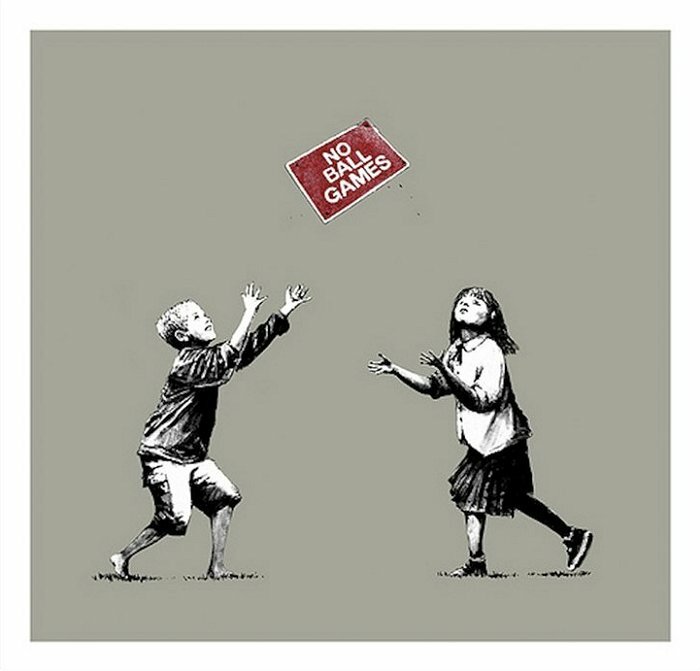 Banksy Art For Sale, No Ball Games Grey.